We welcome you to ZIRCOLABO, gifting you happy and healthy tooth every time. We are recognized as one of the leading providers of FDA approved full and layered Zirconia (Zirconium) as well as Porcelain crowns and bridges in the dental industry. Our personalized services and state-of-the-art technology enable us to offer those dental products that help our clients give their patients natural and good looking smiles that ultimately enhance their lives. All our Zirconia (Zirconium) as well as Porcelain crowns and bridges are cheap and backed by 3 years warranty that creates more translucent tooth. We are fully affiliated to LABOSMILE USA and our every dental technician knows that our attention to the precise details of our each case is what enables us to be a persistent resource for you and your patients. We, a reputed dental lab in Florida believes in focusing on the quality of service, which we ensure by using only proven dental technology and top-class materials to build superior yet cheap Zirconia (Zirconium) as well as Porcelain crowns and bridges which fulfill all the needs of both the dentists as well as their patients. We consider our clients’ satisfied patients as the backbone of our success and you can completely trust us on this because we are known as one of the premium dental labs throughout US, making strong translucent tooth. Besides Georgia, Alabama, Mississippi, South Carolina and North Carolina, we have our clients located in Tennessee, Kentucky, Virginia, Atlanta, Montgomery, Jackson, Charlotte, Columbia, Nashville, Tallahassee, Jacksonville, Orlando, Miami, Tampa, Fort lauderdale, West Palm Beach and Philadelphia. 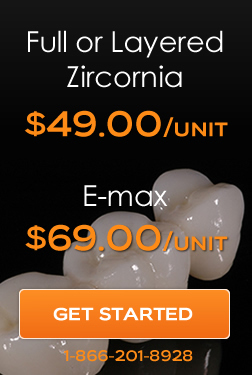 We at ZIRCOLABO, a fully certified dental lab, specializes in offering reliable and long-lasting Zirconia (Zirconium) as well as Porcelain crowns and bridges, which are brilliantly crafted using modern technology and techniques by our experienced technicians. We strive hard to provide our clients healthy tooth in the areas such as Kentucky, Tennessee, Philadelphia, Virginia, etc. with aesthetically superior and cheap products, while keeping up with the requirements given by them for their patients.